Leo Hartland Hardy was born on December 1, 1894, in Beaufort County, N.C., to Joshua Albert and Mary Magnolia White Hardy. By 1900, the Hardy family was living in Beaufort County, and Joshua Hardy was working as a farmer. Nothing is known of Leo Hardy’s life prior to World War I, other than that he was working for the Virginian Railway Company. He enlisted for military service for World War I in the U.S. Navy on April 14, 1917, with the rank of Apprentice Seaman. Hardy is listed for having enlisted at the actually ship the USS Oklahoma (BB-37), a Nevada-class battleship. Hardy served aboard the Oklahoma until September 21, 1917, when he was sent to the USS Solace (AH-2), a Navy hospital ship (possibly due to illness or injury). By this time, he had reached the rank of Seaman Second Class. Leo Hardy appears to have been severely ill or injured, as he was next sent to the U.S. Naval Hospital in New York on, where he remained from September 23 to October 3, 1917. Hardy’s next stations were as follows: U.S. Navy receiving ship in New York City from October 3 to November 3, 1917; USS Oklahoma again from November 3, 1917, to January 26, 1918; and USS Frank H. Buck (ID 1613), commissioned into Navy service from the Associated Oil Company of San Francisco in 1918 as an oil tanker, from January 26 to at least November 11, 1918. The Frank H. Buck made six round-trips to Great Britain in 1918 to transport oil fuel for WWI Allied operations. The U.S. Navy stopped official documentation of Hardy’s WWI Navy service under active service on Armstice Day, but he continued to serve through 1920. Hardy was assigned to the USS J. Fred Talbott (DD-156), a U.S. Navy Wickes class destroyer, which was ordered with a number of other Navy vessels to operate off the Russian coast between 1918 and 1920. They were there in support of American, British, and other Allied countries’ troops that were sent there in support of the White Russians who were fighting against the Bolsheviks as part of the 1917 Russian Revolution. The U.S. had sent 4,500 men and over 500 had been killed for this military action between September 1918 and July 1919. Hardy’s ship also went to a region then under Austria-Hungary and other ports in the Mediterranean Sea during this period. By March 15, 1920, Hardy and the Talbott was stationed in Venice, Italy. Although he thought he would head back to the U.S. by early April 1920, Hardy was issued a job in Italy related to WWI at the end of March 1920. He was ordered to travel throughout a number of small Italian towns, gathering the bodies of American Navy sailors killed in Italy during WWI. Hardy located the bodies in wartime graves in the Italian towns, preparing them for transportation back to the U.S., aboard the USS Nereus (AC-10), one of four Proteus-class colliers. A collier is a bulk cargo ship designed to carry coal, that apparently was converted to carrying the bodies and coffins of the dead sailors. After Leo Hardy returned to the U.S., he was discharged from active service in the U.S. Navy on June 30, 1920. It appears Leo Hardy married Lillian W. Neal by 1922. By 1930, Leo Hardy was living in Charlotte County, Virginia, where he worked as a railroad agent. By 1933, he and his wife were living in Norfolk, Virginia, working as a railroad signalman. By 1940, Hardy was living in small town of Cullen in Charlotte County, Virginia, where he worked as station agent for the Virginian Railway. Leo H. Hardy died on July 29, 1974, and was buried in Roanoke Presbyterian Cemetery in Aspenwall, Virginia. 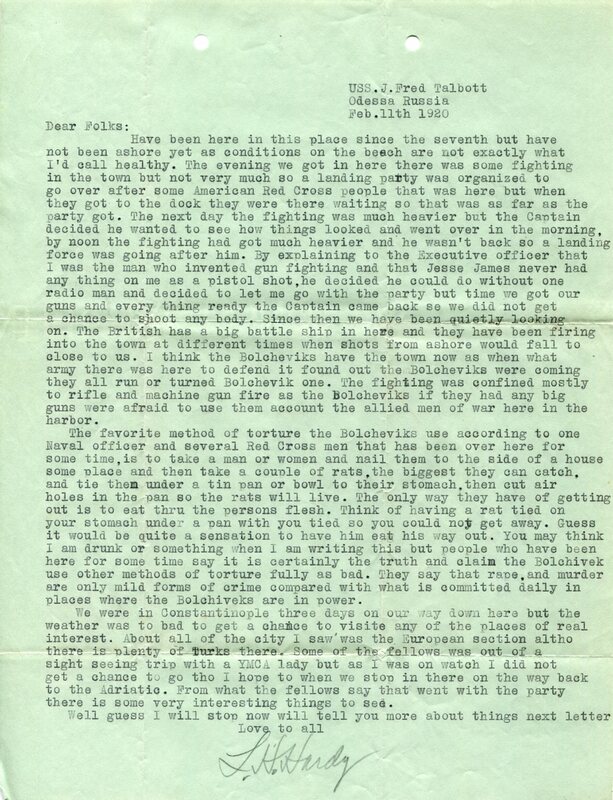 To learn more about Leo Hardy’s WWI and post-WWI service, check out the Leo H. Hardy Papers (WWI 113) in the WWI Papers of the Military Collection at the State Archives of North Carolina in Raleigh, N.C.